That’s Italian for long live the weekend, in case you were wondering 😉 . If our schedule permits it, we like to sleep in on Saturday mornings, we take our time getting out of bed and don’t get around to having breakfast until 11am. Hubby usually turns to me in bed with a smile on his face and asks “can we have crêpes?” Most of the time, I agree, and we indulge. 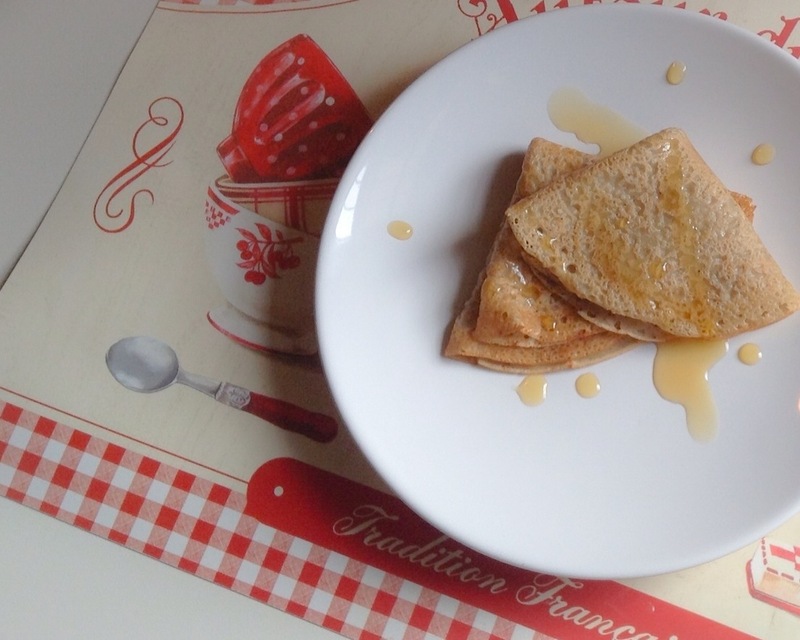 Traditional French Crêpes are not the healthiest breakfast food and are made with white flour and eggs, are cooked in butter and topped with sugar. Growing up, mama used to make them for us on weekends, top them with butter and sugar hot off the pan, and roll them up on to our plates. We sat at the kitchen table and ate while she made one crepe after another. Today, that is definitely a NO NO for my food philosophy and mama has also changed her ways. While she isn’t a vegan, she has adapted her lifestyle and food choices towards whole, natural and plant based foods and has veganized many of her traditional Lebanese recipes, such as Ma’amoul (semolina cookies filled with dates or nuts). I have never attempted them myself, but one of these days I will brave the lengthy process and give mama’s recipe a try. For the time being, let me share a recipe which I’ve veganized myself and which I hope you will enjoy yourself. A healthier alternative to traditional French Crêpes for your next breakfast, brunch or dessert without sacrificing taste! They are light, refined sugar free and nutty in flavour thanks to the addition of an all natural nut butter. Nut butters are made by crushing nuts and blending them to achieve a creamy spreadable texture. They are rich in protein, fiber and essential fatty acids (aka healthy fats that are required for good health) and can be spread on toast or as an ingredient in many recipes to add flavour and texture. As always, everything in moderation, so it’s best not to exaggerate. Sift flour into a medium sized bowl, add vanilla bean scrapings. Add one cup of soy milk and mix well until well combined (no lumps). The mixture will be dense at this point and what you want is a relatively runny mixture. Add remainder of soy milk, a little bit at a time until you get the right consistency. Adjust liquid as needed to achieve the right consistency. Add nut butter and maple syrup and mix well to combine. While the batter is resting, place a small pan over low-medium heat until it gets nice and hot. Brush the bottom and sides of the pan with neutral oil (I used flavourless cold pressed sunflower oil) and use a ladle to pour the batter into the centre of the pan (approx 1/4 cup of batter at a time). Then pick up the pan and tilt it side to side, front to back in a circular motion until batter spreads evenly to cover the entire surface of the pan and slightly up the sides. Serve hot off the pan or warm with your favourite topping. The perfect batter: Depending on the type and brand of flour you use and how it’s produced you may need a bit more or less milk. If you use whole wheat flour you may need to add more liquid. Whatever flour you use, just remember that the perfect crêpe batter should be runny but not too thin and liquidy as the crepes will lack substance. It shouldn’t be too thick either or they will turn out more like a doughy pancake. A good idea is to mix the batter, let it rest 5 minutes and then test it and adjust if necessary by adding more liquid or flour. You’ll know if your batter is too dense when you poor it into the pan as it won’t spread nicely. Heat setting and cooking time: The heat dial setting and length of time depends on your stove. I have a gas stove and it tends to emit strong heat quickly, so I set the dial slightly above the lowest setting and by the time 5 minutes has elapsed and the batter has rested, the pan is nice and hot and ready to go. Then it takes no time to cook. To flip the crepe: After 2 minutes, crepe should be cooked on the bottom side and the batter should be slightly dry on top. Gently peel the edge away from the pan all the way around with a fork and shake the pan until the crepe slides back and forth. Then use your fingers to pick up the crepe and flip it, being careful not to burn yourself. If the crepe is too delicate and you can’t pick it up without destroying it, try using a little more batter next time. On the other hand, if the crepe is too thick, 2 minutes won’t be sufficient and the top of the crepe will still be wet and gooey so you’ll want to use a little less batter for the next one.